Desborough Town take on Rothwell Corinthians in an Easter Monday derby showdown at the Waterworks Field this afternoon. 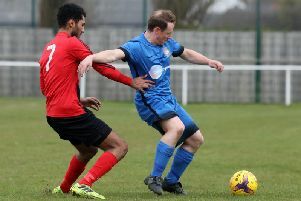 Corinthians boosted their hopes of avoiding the drop from the ChromaSport & Trophies United Counties League Premier Division with a 1-0 success at Cogenhoe United on Saturday while Ar Tarn went down 2-0 at Harborough Town on Good Friday. Wellingborough Town are also battling to avoid the relegation and make the short trip across the county to take on Cogenhoe today. Stewarts & Lloyds get the chance to move into the second promotion place in Division One when they take on Oakham United at Occupation Road. With second-placed ON Chenecks not playing until tomorrow (Tuesday) when they go to Burton Park Wanderers, the Foundrymen will leapfrog them with victory this afternoon. Thrapston Town face the toughest of tests today as they travel to runaway leaders Peterborough Sports, who confirmed their promotion to the Premier Division on Saturday. There is also a morning derby-date as Whitworth, who didn’t play on Saturday, take on Irchester United in an 11.30am kick-off at London Road. And another derby clash takes place at Kiln Park tomorrow evening when Raunds Town host Rushden & Higham United.